Brooklyn Flea Green Market Opens! 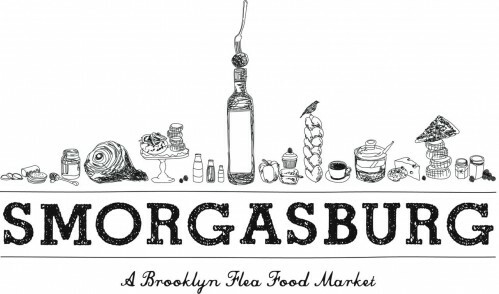 Starting May 21, we’re launching an all-food bonanza called “Smorgasburg”—every Saturday at the new Williamsburg site from 9am to 5pm. Smorgasburg (thank Brownstoner for the name and Camden for the awesome design) will feature 100+ food vendors—packaged, cooked, raw, Mason Jar’d, and more—as well as a bonafide GrowNYC Greenmarket with 15-20 farmers (see lineup below). We’ll have lots of updates in the weeks to come (sign up to receive news at Smorgasburg.com; follow us on Facebook and Twitter). But right now what we want are the very best food vendors/purveyors/growers anywhere to apply for Smorgasburg, so we can create the next phase of local/regional market, and also make the tastiest/healthiest/ friendliest food available to as many people as possible. If you’re interested, click here to apply. And help spread the word if anyone you know would be perfect for Smorgasburg. Thanks! Here are our goals with Smorgasburg: directly connect local/NYC purveyors with regional farmers/producers; make good, fresh, affordable food accessible to as many people as possible; provide purveyors and farmers with a platform to sustain their businesses; and create a market that makes eating and buying food fun, democratic, and easy. But that’s not all. We’ll also have a kitchenwares booth by the fine folks at Williamsburg’s Brooklyn Kitchen; an interactive kids activities area organized by Moomah, the awesome Tribeca playspace, featuring Moomah’s signature art projects that foster connections to each other and the world around us—at Smorgasburg the projects will explore the foods found at the market as well as the sights and sounds of Brooklyn; Kickstarter, the largest funding platform for creative projects in the world, will bring inspiring work from its creative community to market at its Smorgasburg/Flea Pop-Up. In addition to Kickstarter publications and products, visitors can purchase wares directly from local Kickstarter project creators, participate in workshops and meet-ups, or just learn more about them; and special chef demos, food-education events, scavenger hunts, and more.